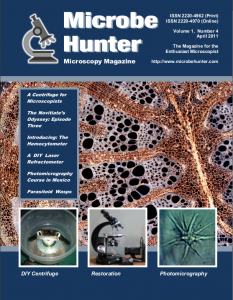 Welcome to the fourth issue of MicrobeHunter magazine. You can download the PDF and order a printed version. Commercial centrifuges can be expensive, why not try to make your own? Experiences and lessons of restoring antique microscopes. Haemocytometers are specialized specimen slides that are designed to quantify the cell density. It is possible to make one yourself to measure the refractive index of different mounting media. From Mexico, sharing our love of microscopy to young scientist aspirants. In this contribution we describe the life cycle of Aphidius colemani, a parasitoid wasp. Víctor Rafael Zárate-Ramírez et al.